Jordan-Small Middle School student Kaitlyn Gedicks is The Windham Eagle student of the week. The 13-year-old is in eighth grade, and has her sights set on attending Yale after graduation. “Kaitlyn is an outstanding student. She is always polite and courteous to other students and willing to lend a helping hand to anyone in need. The quality of her work on any assignments is outstanding and she asks clarifying questions to ensure she has a good understanding of the task at hand. Kaitlyn demonstrates a growth mindset, has a strong work ethic and a positive attitude in class,” said the Academic Enrichment Team which nominated Gedicks. 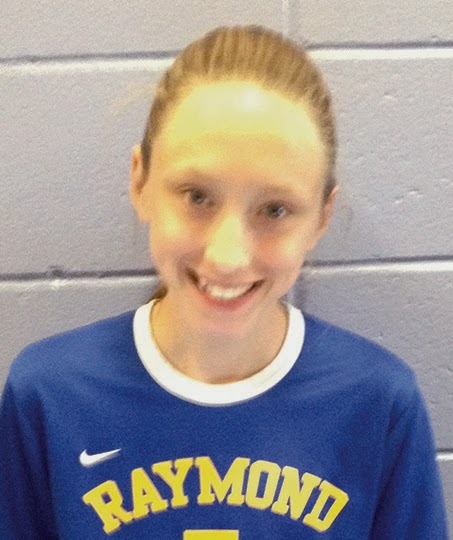 She is involved in soccer, basketball, track, lacrosse, JSMS drama productions, chorus and piano lessons. When she grows up she would like to be a pediatrician. If you see teal pumpkins this Halloween, it’s not just a new fad in decorating, it’s a signal to parents and children with food allergies that the home with the pumpkin is food allergy friendly. Normally, finding treats that won’t cause allergic reactions can be tricky. This new tradition is thanks to the Food Allergy Research & Education (FARE), which is focusing on inclusion and safety. The Teal Pumpkin Project asks people to paint a pumpkin teal, the color of food allergy awareness, to indicate that their home is safe for trick-or-treaters with food allergies and offering non-food treats such as small toys. Ideas range from glow sticks and bubbles to mini notepads and spider rings. “Available at dollar stores, party supply stores, or online shops, these low-cost items can be purchased and handed out to all trick-or-treaters, or made available in a separate bowl from candy if you choose to hand out both options. Nearly all of these items can be found in a Halloween theme or festive colors,” FAME said. According to FARE, food allergies affect one in every 13 children or roughly two in every classroom. That's a lot of kids who might feel left out of the festivities. If you would like to participate in the Teal Pumpkin Project this Halloween, visit www.foodallergy.org. Cook onion, water chestnuts and green pepper in 1 tablespoon oil on medium heat for about 5 minutes. Add cabbage and cover for about 10 minutes. In another skillet, cook beef or chicken in 1 tablespoon oil on medium heat. Reminder: If fresh meat was used, add Chinese five spice. Add the meat to the cabbage mixture once the cabbage goes limp. Add your sauce and cover on medium heat for about 5 minutes. Take off heat and uncover. Let stand for about 5 minutes before eating. Kelly and I have been making this recipe and variations on it at home and love it. The more times a week we make this, the better we feel. We have never been big chefs, opting for eating out and delivery with our busy lifestyles. The recipes found on the www.mendabody.net website are perfect for us. Once we have our ingredients, we are able to make everything at home. I've been on your program a little over two months and I love it but I find that your recipes don't provide the number of servings it makes. Once everything is mixed, how does one know if they've got the correct amount of protein or fiber needed? Please help! Thanks for the email. Our recipes are mostly submitted by clients and coaches who are self-made recipe writers. We do encourage those who share their recipes to share serving size information as well and sometimes it does happen, but often times they are just judging by their own tastes or preferences. In the future, we have dreams of having professional recipe writers on staff....in the meantime, your best bet is to factor in the anticipated servings you will be dishing out and then make sure there is enough fiber/protein to go around. For example, if you are making the shrimp scampi recipe and you anticipate sharing between four people, you will want to make sure you incorporate at least two cups of fiber (one-half a cup per person) and approximately 16 oz. of the shrimp (4 oz. per person). Hope this helps! Michelle Libby - I had my first big test last weekend, when I went away for a conference, where I would not solely be in charge of what I was eating, but I found out that over the last 14 weeks I have learned how to deal with long drives (be prepared), pre-determined meals (avoid the rolls and eat the meat) and know that I have to keep drinking water to stay hydrated. I did very well and was praised by my coach, which is a great feeling, since she’s lost 100 pounds and is well versed in all things Mend-A-Body. This week was a tough one until I put on my winter jacket. Seriously…it was the last thing in the world I thought I would have to worry about. My two winter jackets that I love, that have my company name embroidered on them are way too big for me. Last year I could barely zip it. I thought a tight jacket would make me look skinnier and this year I look like I am wearing a jacket that is two sizes too big and am swimming in it. What a great feeling. I went in to get my hair done at Chic Boutique with owner, Barbie Smart-Damen today and as I walked in she started off by telling me how great I look and how she can see a huge difference in my face. I haven’t seen her since I started with Mend-A-Body so she sees a huge difference and I love it! The motivation to reach my goal of 150 pounds comes from feeling great and the amazing comments that I continue to get out and about in town. I also wanted to make sure you know that one of the reasons for us doing this other than to lose weight is to help other people find a program that works so they can lose weight. I have had a few people nervous to ask me personal questions about this and I hope that if anyone has any questions that he or she reaches out to me. Please do not hesitate. It feels great to get healthy and to lose that weight that you have wanted to lose for a while. If I can make this lifestyle change… anyone can. Most of us probably know that texting while driving is dangerous and illegal in the State of Maine, but lots of people have been caught breaking this law lately. It’s tempting, right? One text is all it takes. One second you’re perfectly fine and the next, you’ve sideswiped the car crossing the road in front of you. This has become more common over the years and some people are starting to recognize that, like the telecommunications corporation, AT&T. AT&T has come up with “It Can Wait”, their newest campaign to stop texting and driving. Basically, whenever you’re texting someone and getting ready to drive, but you don’t want to end the conversation, type #X. This means that you aren’t done with the chat, you’re putting it on pause. This campaign was created in 2009 by Cathy Coughlin, AT&T’s global marketing officer, but is just recently becoming more popular. “The fines are very high. It (the law) is publicized well and is an automatic ticket,” Windham Police Officer Jeff Smith, currently a school resource officer for Windham High School, said in a recent interview. Officer Matthew Cyr, a community services officer from Windham Police Department, gave me his opinion on “It Can Wait.” He believes that the law on texting and driving still needs much enforcing and is not just a teenage thing. “I have seen lots of incidents in Windham lately,” Smith admits. In 2013, over 3,000 crashes involving distracted driving were documented in the State of Maine. That same year, 12 deaths occurred, also because of distracted driving. Drivers who are texting are 23 more times likely to get in an accident than drivers who aren’t. AT&T made an app to go along with the “It Can Wait” program called AT&T DriveMode. This app can be set up to automatically send a customized reply to all incoming text messages, emails, and wireless calls when the car reaches a speed of 25mph or more. If you go under 25mph for five minutes or more, the app will shut itself off and you can view missed messages and calls. The purpose of the app is to make the roads safer, which is why it will only let one music and or navigation app run at the same time as the app does. To download the app, go on Google Play or AT&T app center. If you do download the app, AT&T assumes you are pledging to “It Can Wait” and will no longer text and drive. To find out more about #X and “It Can Wait”, visit http://www.itcanwait.com/all. You can also learn about celebrities who have pledged and learn how you can get involved in the campaign. Over 5,000,000 people have pledged.